Authenticity (n.): The quality of being authentic. Authentic (adj. ): Of undisputed origin; genuine. Lately, I’ve been contemplating what it means to be completely authentic. That contemplation has led me to question and a desire to search for what that means for me on emotional, spiritual, physical, and energetic levels. What does it mean to speak my truth? What is my truth? What/Who is my authenticity and how can I fully show up as that self? I’m spending this cool and rainy Sunday morning working on something super-exciting for you all! It’s going to include meditation, asana, soul-searching, and getting in touch with our truth. Stay tuned and I hope you will join on this journey as we contemplate and work toward discovering and uncovering our authentic selves! It gave me pause as I continue to develop on my own personal awareness of how I treat myself in thought, word, and action. Our bodies are wonderful and amazing things and I rarely take time to appreciate just how spectacular my body is. I should mention that when I speak of my body, I am speaking from the perspective as someone who identifies as white, able-bodied, and fit. My identity in this body has evolved over time. For a very long time, I loathed this vessel with a fierce and deliberate focus. I denied myself nourishment, I berated my image in the mirror, and I treated my body without the respect and honour it deserves. In short, I was abusive toward myself and fed into ideas that if my body wasn’t meeting some “ideal” I had in my mind, then I was unworthy of love and respect, not only from myself, but others as well. When I began practicing yoga, the abusive relationship I had with myself began to change. I began to see my body through a different lens and began the process of softening my relationship with myself. The practice of yoga, both on and off the mat, was (and is!) teaching me that this flesh, muscle, and bone create spaces where incredible things happen. My practice creates spaces where I nourish myself and others without depleting my spirit. This flesh, muscle, and bone create spaces where healing takes place and gratitude takes hold. The abuse I inflicted on my body gradually began to melt away. I began to understand what I needed to feel nourished, kinder self-talk began to pass through my lips, and I started to respect all that my body does for me on a daily basis. It has been a long process of discovery and breaking down old habits to replace them with new ones. My body moves, breathes, sees, hears, feels, tastes, and experiences. My body journeys and my story is written in that continuous exploration of the relationship I have with myself. I continue to seek ways to give my body what it deserves…respect and honour. Have you ever met a person who just speaks their mind? Not in a mean or confrontational way, but in a way that is compassionate and true to who they really are? They come across as grounded, confident and sure of themselves…fully aware of their needs and with an ability to express those needs in clear and concise ways. These individuals have a fully realized Throat Chakra, or Vishuddhi. The energy that resides there isn’t blocked and, as a result, clear communication and expression of self can occur. In addition, when this energy flows freely, we have the ability to listen and process what is happening both around us and inside of us…at our core. Individuals who experience energy blockages in their Vishuddhi will often find it hard to speak openly about their thoughts and feelings; will typically say what they think others want them to say; may find it hard to process and listen to others; and may have throat, mouth, and metabolic issues. When I was in Bali, I had the opportunity to meet with a life coach who gently smiled at me, put her hand on my arm and said, “your Throat Chakra is completely blocked!” I was at a point of transition in my life and was finding it very difficult to put voice to the changes that were occurring. I knew major shifts were happening and there were things I needed to express in order to fully move onto my new path. Not only was I unable to express myself through this change, I also wasn’t listening to my core self…the one that was emerging in this time of transition. However, the things I needed to say included “no” and “goodbye.” It was a “no” to a life I had been living that wasn’t serving me in the best way and “goodbye” to a job and city that had defined me for a better part of my life. I knew that in order to fully invest in myself and the new direction my life was going, I needed to be able to speak these words aloud…and with love and compassion for myself. As I continue on this path, I realize just how amazing speaking from my true self is. I am able to communicate clearly, I am much more creative, and I connect with others on deeper levels. I am by no means a pro at it, but I continue to work on my voice, allowing it to guide me and truly listening to what it has to say. If you are ever feeling as though you are unable to express yourself fully, yoga can help. A few asanas that can help release energy blockages in the Vishuddhi include Halasana (Plow), Ustrasana (Camel) and Salamba Sarvangasana (Shoulderstand). Chanting can help, including the repetition of a guttural sound in the throat. You can also work with Jalandhara Bhanda (Net-Bearer Bond) or meditate on the colour blue (blue is the colour of this Chakra). I find that when I integrate these poses, sounds and bonds into my practice, I engage Vishuddhi in different ways, igniting energy and freeing up my ability to create and articulate. I encourage you to play with this idea of connection to true self through the Throat Chakra…see what your true self has to say! I have feelings that need to be expressed. I will not always be perfect. I don’t have all the answers. I don’t need to hold it together all the time. I won’t always be the exceptional partner, friend, daughter, sister, teacher, etc. I stumble, I slip, I fall and sometimes I cry, get angry and act frustrated. Growing up, I put a lot of pressure on myself to be “perfect” (aka “not human”). Whatever my definition of perfection was at that given moment…that is what I was chasing. As a result, I was consistently stressed out and living in the past or planning for the future. I re-evaluated every action I took and planned with thoughtful detail how I would act if a situation ever arose again. I was trapped in a vicious cycle of comparison and competition…not with others, but with this perfect idealized version I had created of myself that didn’t actually exist. When that level of perfection wasn’t achieved, I would find myself at a loss…berating myself for not being able to live up to this imaginary level of success. That’s a lot of pressure for person to be putting on themselves! 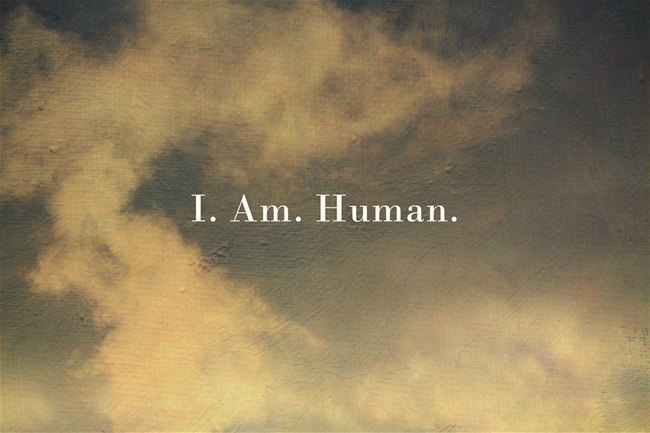 And, in being human, I am figuring it all out…just like everyone else! And, figuring it out takes time. What I am learning most of all is that I need to be gentle with myself. I need to hold myself in the same regard and extend myself the same compassion as I do others. I am not separate from those I come in contact with…rather, I am one in the same. When we recognize our collective humanness, it allows us to become more understanding of ourselves. When we can see ourselves in others, it means we are no less worthy of love, patience and kindness. I saw someone posted a challenge to write your story in 100 words. I was intrigued. Could I distill the essence of my thirty-something years on this earth into just 100 words? How could I encapsulate all I’ve felt and experienced (not to mention what I am currently feeling and experiencing) into just a short paragraph with no room for explanation or qualification? And…then I realized…for me, that might kind of be the point. So, here it is. Me, in 100 words. Open your heart, open your mind, open your soul and feed your addiction for adventure and new experiences. Keep tossing caution to the wind and trusting yourself that YOU know what is best for you. Keep your family and friends close for they are the ones supporting you on this wild journey called life. Keep moving, flowing, loving and glowing. Keep teaching, sharing, inspiring and caring. Keep things simple. Keep your feet on the ground, your head in the clouds and your heart in your hands. Offer it all for the benefit of yourself and others. Love the journey. 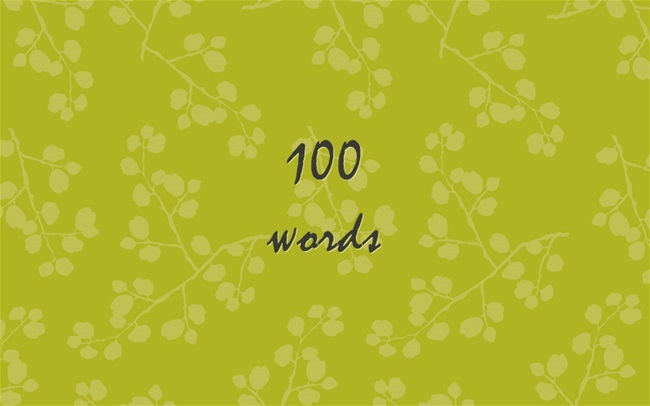 What are your 100 words? Share them in the comments below!